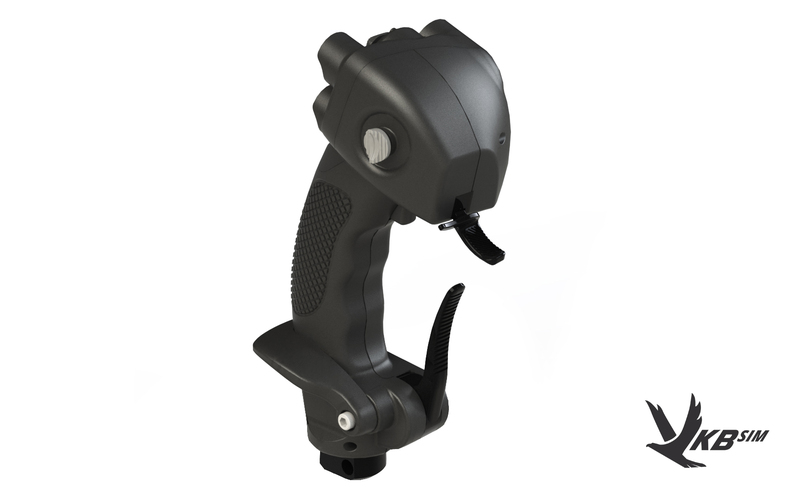 After VKB’s initial announcement of the MCG Grip back in March of 2017, VKB HQ has gathered a lot of useful feedback from the simulation community across the web. 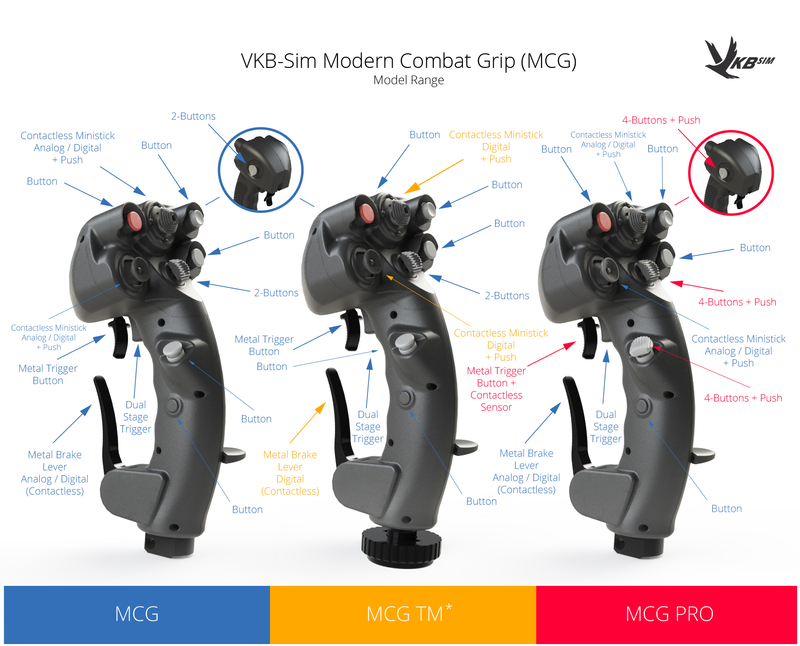 This feedback changed the course of the MCG development and VKB has decided to expand the Modern Combat Grip range to include a total of three variants. The real grip was developed by AVIAAVTOMATIKA in Russia for Sukhoi’s modernized Flanker series of fighter jets, as well as their 5th generation prototypes. VKB engineers adapted the ergonomics of the real Flanker grip for the use in flight simulations with only minimal design changes. - Order availability, shipping date, as well as final MSRP for MCG-TM and MCG-Pro to be determined and announced at a later date – stay tuned! I am so hyped for this! Would this be a standalone product I could buy and use or will is just be sold as a grip which requires me to buy another product? If so, which product should I get to be prepared for the MCG? Looking great, cant wait to put in an order for the MCG Pro! sahaka wrote: I am so hyped for this! Would this be a standalone product I could buy and use or will is just be sold as a grip which requires me to buy another product? If so, which product should I get to be prepared for the MCG? It's just a grip! Maybe in the future, VKB will be bundling the grip with the Gunfighter, but that's not decided yet. So for now, the MCG grip is a standalone product and requires a compatible base! The MCG and MCG Pro will be compatible with the VKB Gladiator Pro/Pro Mk.II and the Gunfghter bases without adapter. It should also be compatible with the VKB Mamba Mk.III, but I am not sure if an adapter is needed for the Mamba. The MCG TM is compatible with the Thrustmaster Warthog/Cougar bases (without adapter). These look superb, I especially like the pinkie button being re-positioned to the side where it won't clash with the brake lever. I hope the Kosmosima grip is simply a mirrored version of the MCG. Looking great! Hoping to order this grip with the Gunfighter base once it's back in stock. Last edited by DawnWing on Thu May 04, 2017 18:52, edited 1 time in total. There will be a MCG Replica Edition at a later point that's made from metal. No ETA yet. Cant't wait for these - will it work with Gunfighter pro ii base? Please can we have left handed version as well? Would you be able to distribute pictures outlining the difference between Gunfighter and Gunfighter Rev B? My Gunfighter Pro was shipped on May 5th, and i'm trying to figure out whether or not mine is Rev B. This Rev B "stuff" outta the blue is very concerning. At the very least will VKB be providing a parts kit to upgrade the first run of gunfighters to rev b? Let me re-post what I said in a different thread. First, there is NO "NEW MODEL" - A and B versions are identical, technically and functionally, with a single difference: the contact group has been switched, what was on the top went to the bottom, and vice versa. We did it mainly to streamline the assembling process. IF you are going to get a GF, you should stay with MCG B. IF you are going to buy an MCG set, then you don't have to bother about this A or B thing altogether. Once again, the only difference between A and B is the juxtaposition of the parts of the contact group. How long will you support revision A gunfighters? How long before my interchangeable system(s) becomes completely obsolete? Will you even sell left handed MCG for rev A? Don't you realize this hurts the trust in VKB with the constant changes of your product lines like this, I bought my two gunfighters because I was lead to believe they would be future proof. milliways wrote: How long will you support revision A gunfighters? Looks you opted not to read what I wrote in detail. Both versions will be supported for the same period of time. Unlike some well known companies who introduce one new model in 7 years, we are constantly working on producing devices with the best functionality/quality/price rate. Currently our RnD guys are working on the new Gunfighter version, MkII, which in due time will be followed by MKIII, and so forth. This is what is known as "progress". We believe that making a new model every year is better than once in 7 years. New models don't automatically render previous ones as "obsolete".